კიბელე (ძვ. ბერძნ. Κυβέλη, ლათ. Cybele) — წარმოშობით ძველი ფრიგიული ღვთაება, დიდი დედა, მიწიერ არსთა მშობელი, ბუნების ამყვავებელი, განმანაყოფიერებლი და ამაღორძინებელი. მისი კულტი დიდად იყო გავრცელებული მცირე აზიაში და ადრევე შეერწყა ბერძნული ღმერთქალის, რეას კულტს. იდუმალებით მოცული ძველი ფრიგიული ქალღმერთი მთის მწვერვალებზე ცხოვრობდა და დააქროლებდა ძვირფას ეტლს, რომელშიაც შებმული ჰყავდა ლომები და ჯიქები. მას შეუყვარდა ჭაბუკი ატისი, ატისმა კი მოკვდავი ქალი ამჯობინა. განრისხებული კიბელე ქორწილში გამოჩნდა და ყველა გააგიჟა. გადარეული ატისი მთაში გაიქცა და თავი მოიკლა. მისი მოსაგონებელი დღესასწაულები კი ისევ კიბელემ დააწესა. Lotte (1997). The Faces of the Goddess. New YorkMotz: Oxford University Press US. ISBN 0-19-508967-7. Roller, Lynn Emrich (1999). 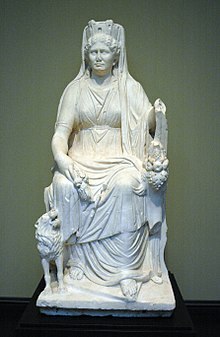 In Search of God the Mother: The Cult of Anatolian Cybele. Berkeley and Los Angeles, California: University of California Press. ISBN 0-520-21024-7. Vassileva, Maya (2001). "Further considerations on the cult of Kybele". Anatolian Studies (British Institute at Ankara) 51, 2001: 51. . JSTOR 3643027.
ეს გვერდი ბოლოს დარედაქტირდა: 10:25, 1 მაისი 2017.